Unimog 939 was called out to Cleveleys this morning, due to some plastic sheeting being wrapped around an overhead wire hanger on the southbound track at the north end of the Orion Curve. 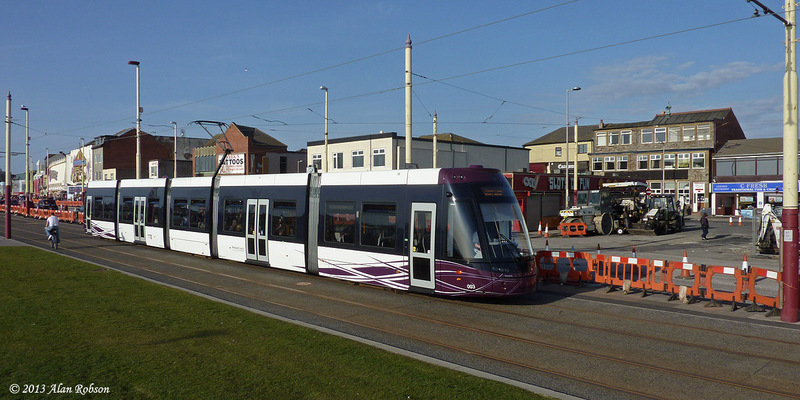 The Unimog was driven into Cleveleys tram station and the rail wheels lowered so that the vehicle could be driven along the reserved track to the offending traction pole. 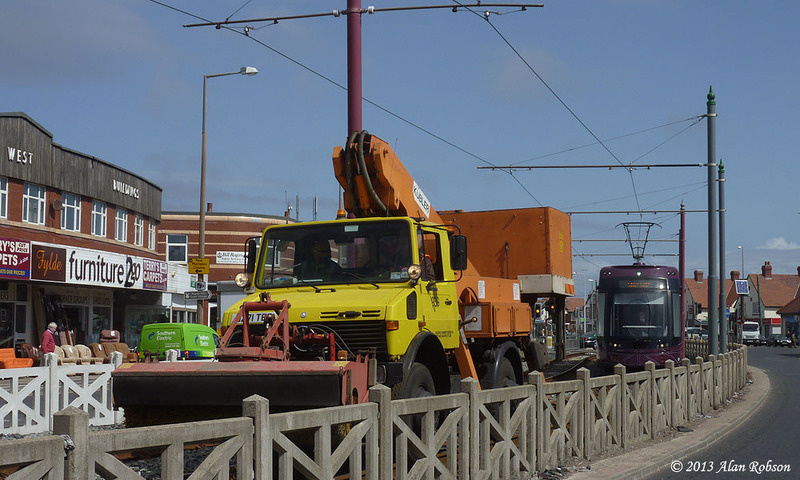 The hydraulic jacks were deployed on the Unimog and the plastic sheet was disentangled from the wire hanger by the overhead line crew. Only one service tram was slightly delayed by the incident, this being southbound Flexity 006. 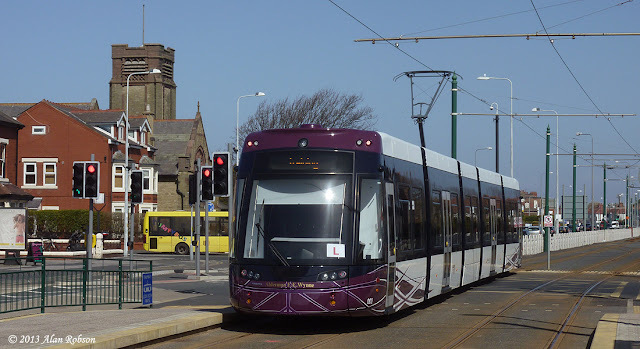 Flexity 002 has still not managed any decent spells of use in passenger service yet. 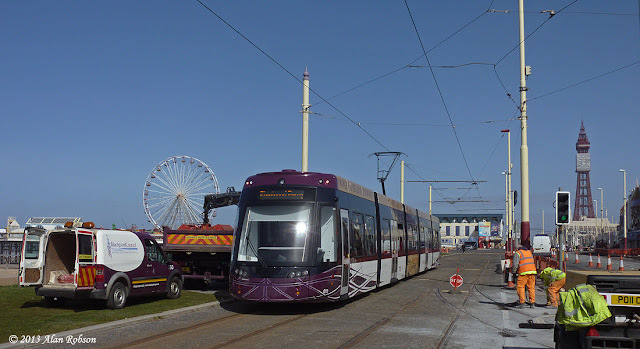 After its brief appearance in service last Saturday, it seems to have reverted to its old ways of hiding out of sight or being used on driver training. 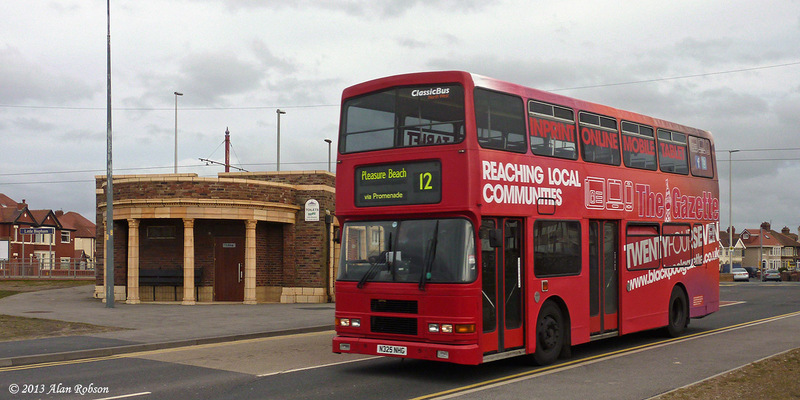 002 was noted out on training again today as it passed Central Pier. 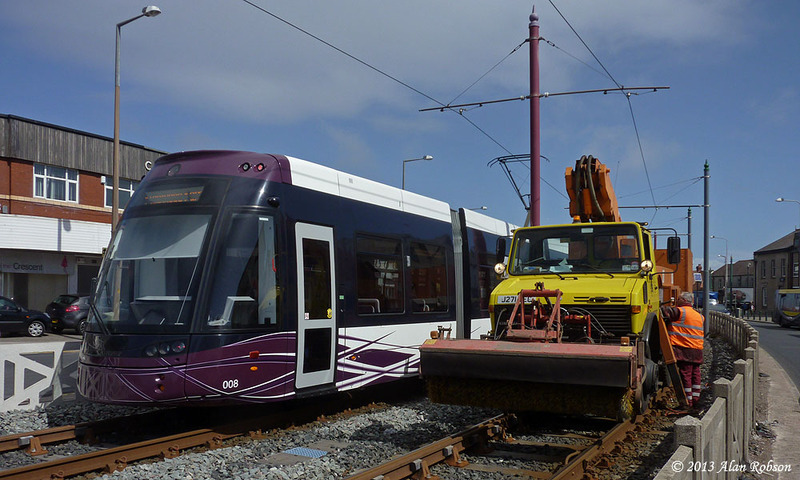 Box car 40 was moved from Rigby Road depot to Starr Gate depot this morning. 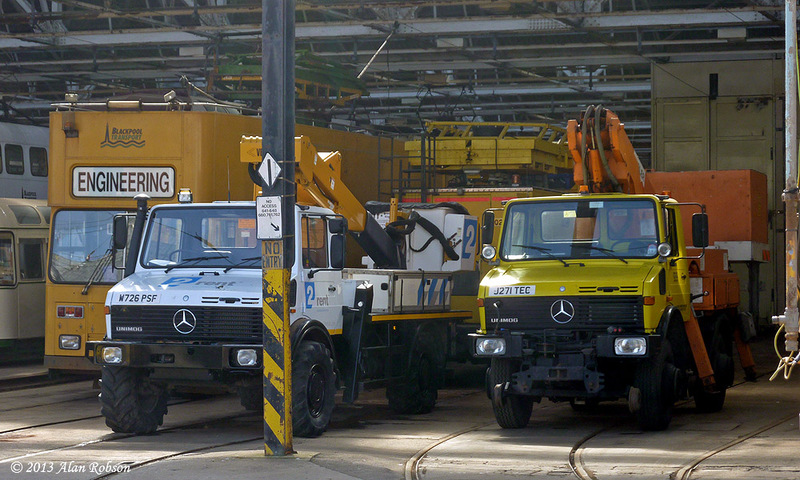 It was towed out of the depot as far as the crossover at Foxhall by the Unimog, with the trolley leading but tied down. At Foxhall the trolley was untied and raised onto the overhead wire, after which the tram proceeded to Starr Gate depot under its own power. 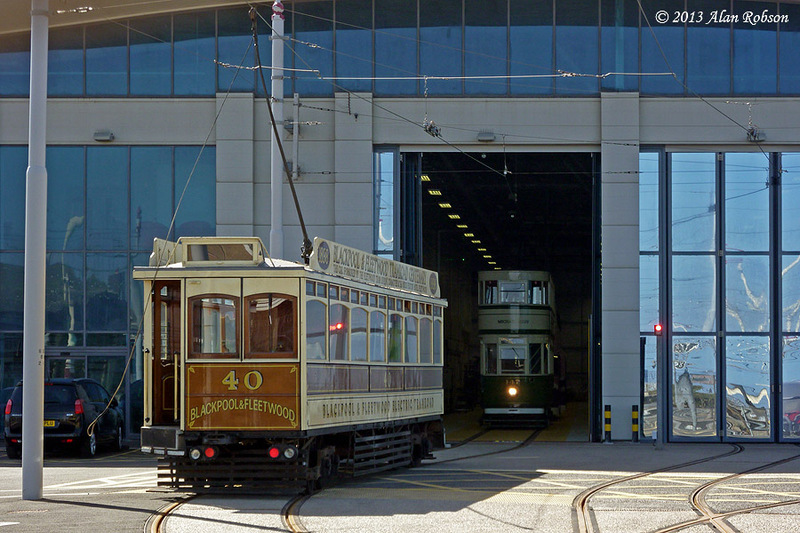 Box 40 was put onto the left hand road on the engineering side of the depot at Starr Gate. On the same track that 40 was stabled on were Standard 147 and widened Balloon 713 (at the rear). 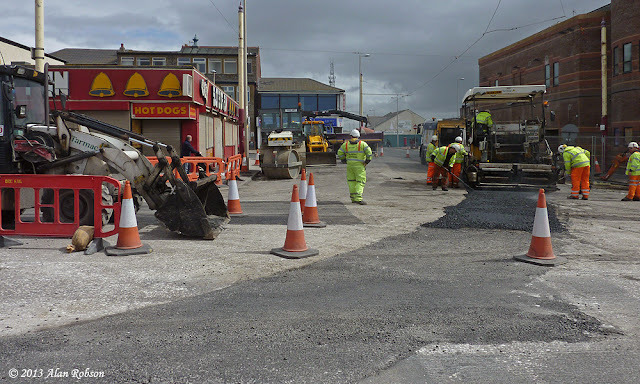 The road surface was being dug up at the former Foxhall Square turnout earlier this week, where the Princess Street line used to branch off from the promenade. 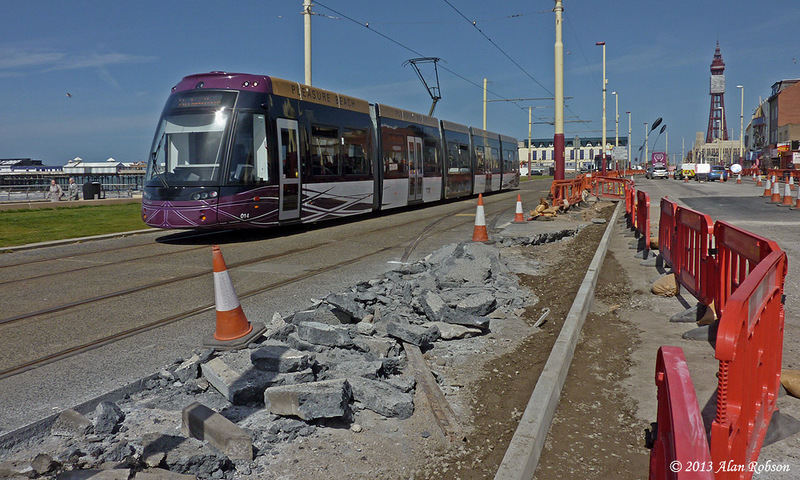 New kerb stones were being laid prior to the pavement being extended across the gap where the tram line used cross the prom. There are currently no plans to remove the redundant pointwork, it will simply be left in situ, similar to the points at Talbot Square that are unlikely ever to be used either. 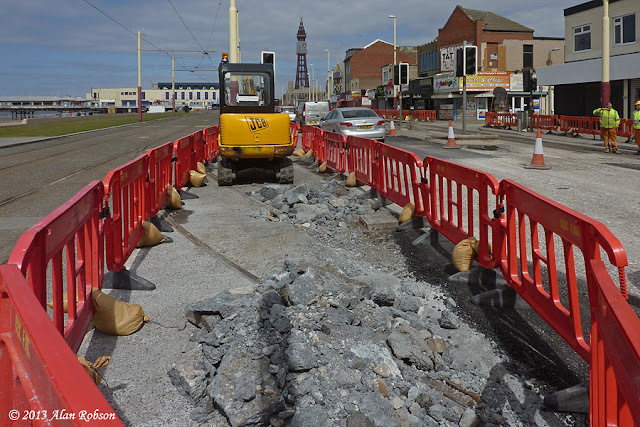 Blackpool Transport have temporarily acquired themselves another Unimog overhead maintenance vehicle. 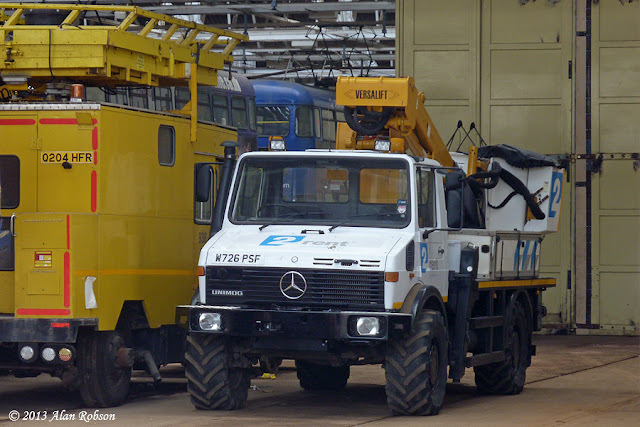 Mercedes U1550 Unimog, registration W726 PSF, is currently on hire from specialist vehicle company "2rent". 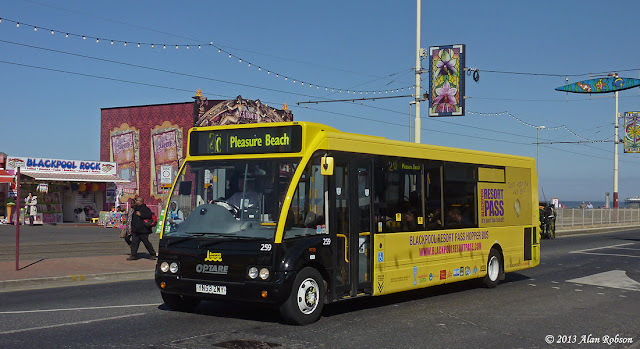 Whether this is a short term replacement for 939, Blackpool's own Unimog U1650, or just to supplement it is not known. 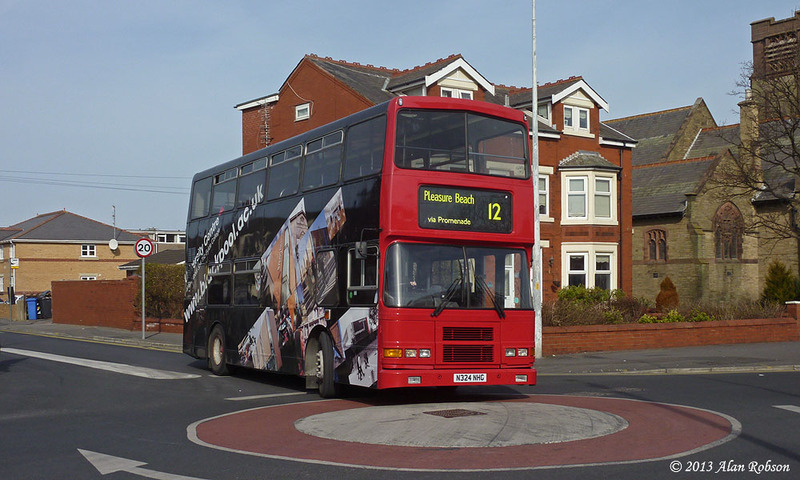 Blackpool Unimog 939 was noted parked outside at the rear of Starr Gate depot earlier on this week. Named Flexity 002 continues to remain rather elusive since it returned from Bombardier. 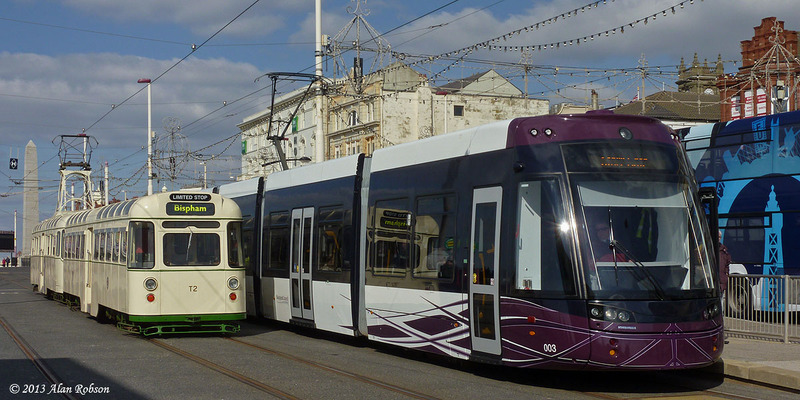 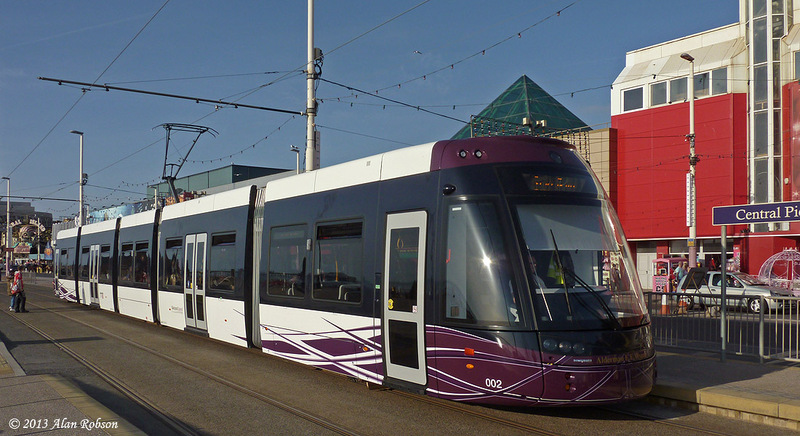 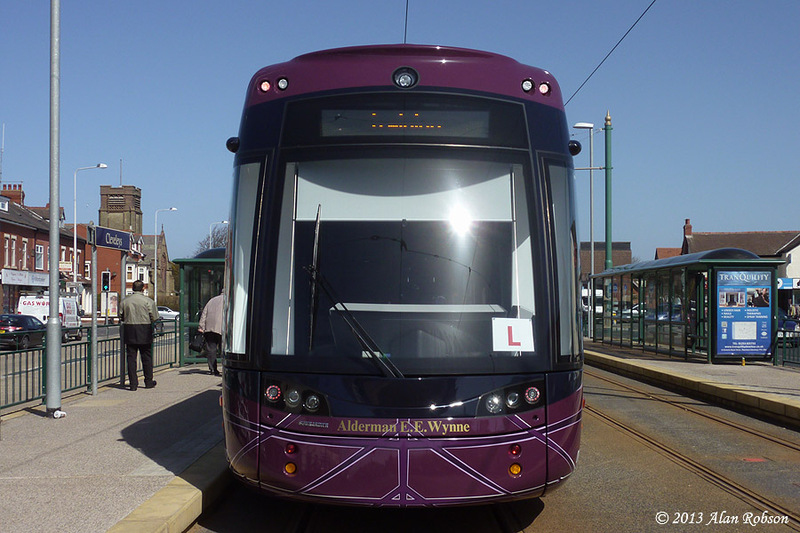 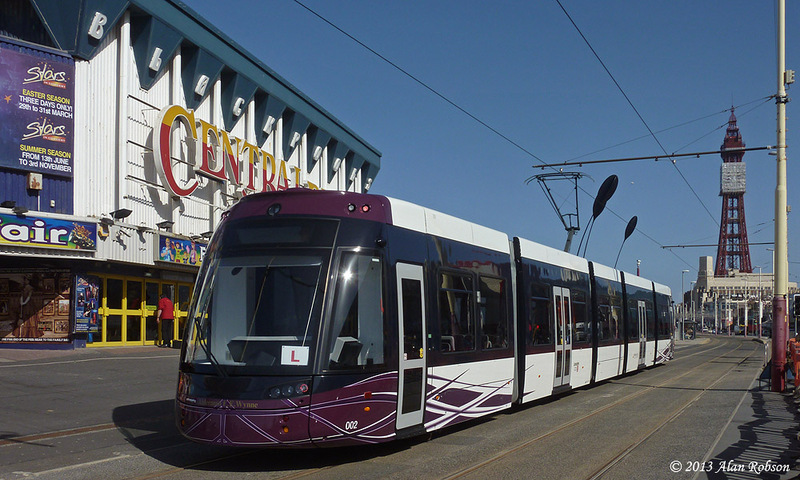 The tram has been noted on driver training duties on a few occasions, but has spent even less time actually being used in service. 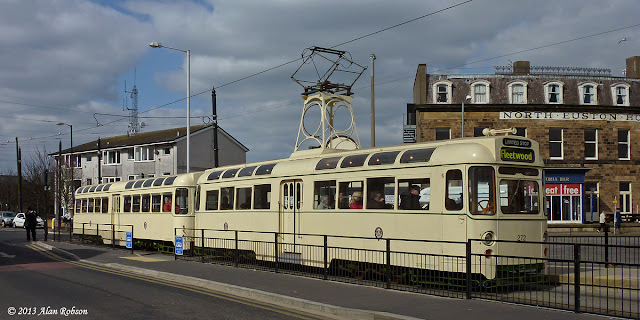 On Saturday 20th April, 002 put in one of its extremely rare appearances spending the day running on the Starr Gate to Fleetwood passenger service. 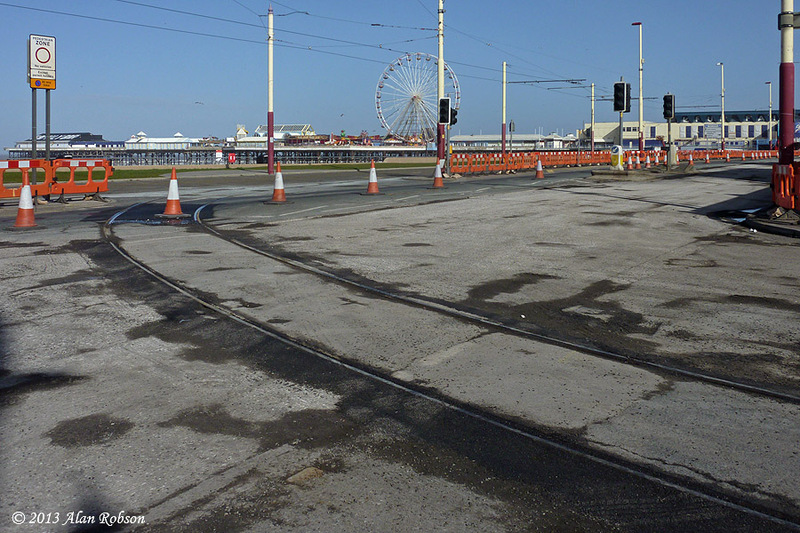 127 years of Blackpool tramway history ended today, when the rails across the promenade at Foxhall Square were finally lifted and filled in with tarmac. 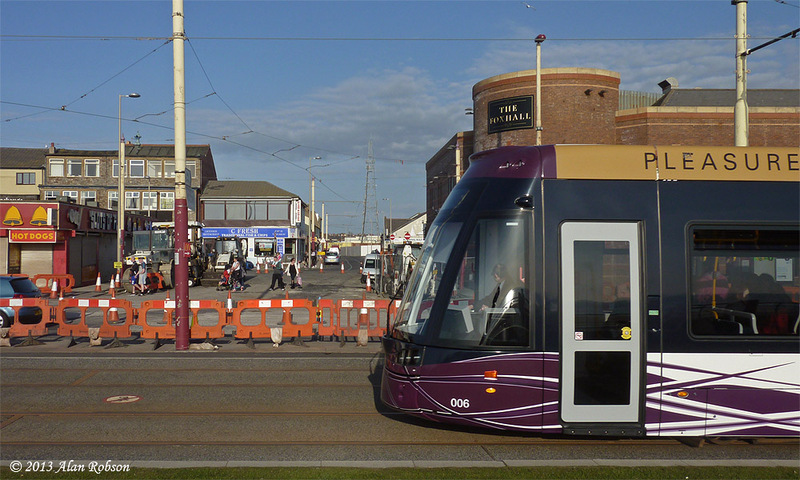 The Foxhall line was originally laid to serve the then new Blundell Street Depot, which opened in September 1885 to house the original conduit trams that ran on the tramway. 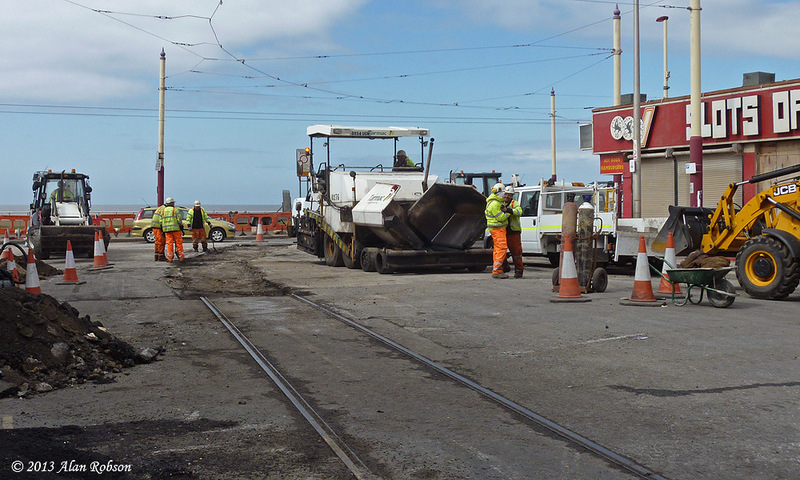 With the overhead for the line being disconnected on Monday, the lifting of the rails now seals the fate of this once historic section of tram line. The end of an era has dawned for the original access track to the old Blundell Street depot along Princess Street. 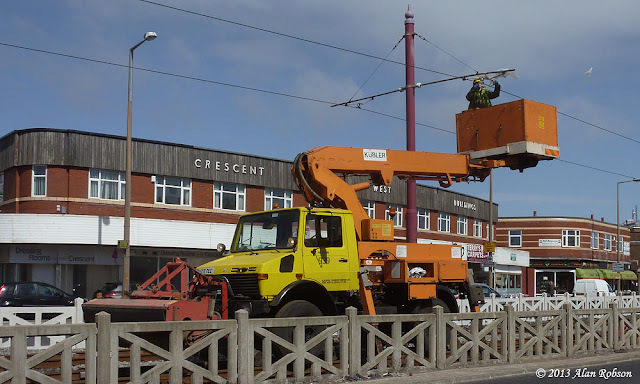 Last night the overhead line gang removed the junction frog at Foxhall Square, and tied back the Princess Street wiring to the traction pole next to the points. The overhead wires on the promenade now run straight through at the Foxhall Square junction, eliminating any future prospect of trams once again using the Blundell Street trackage as a diversionary route to Rigby Road depot. 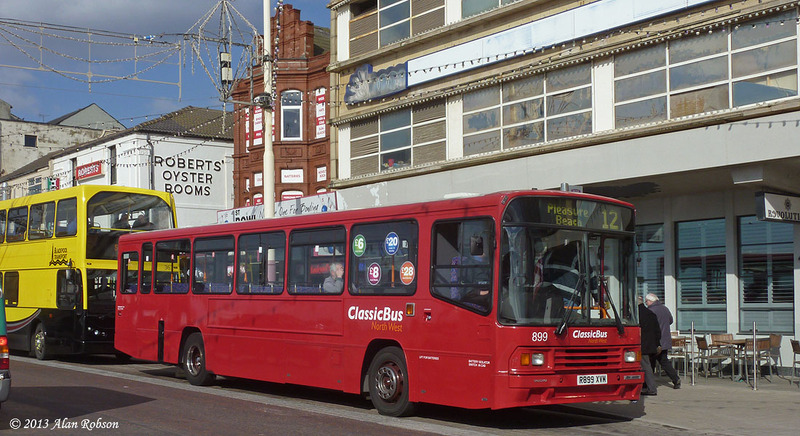 Classic Bus North West Volvo Olympian N325 NHG (ex Dublin Bus) has received an all-over vinyl wrap advert for the Blackpool Gazette newspaper. 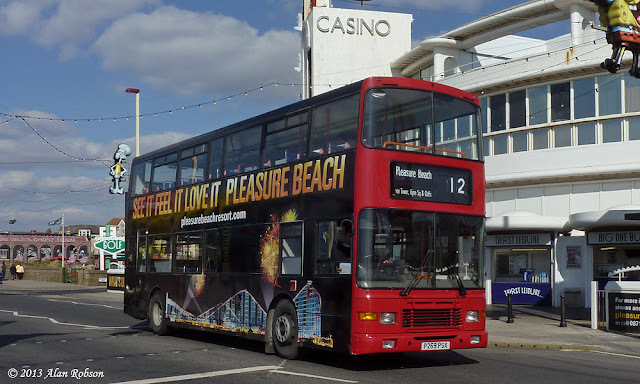 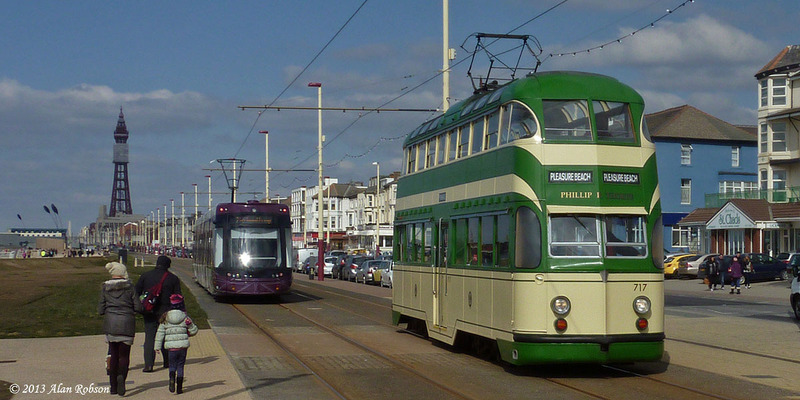 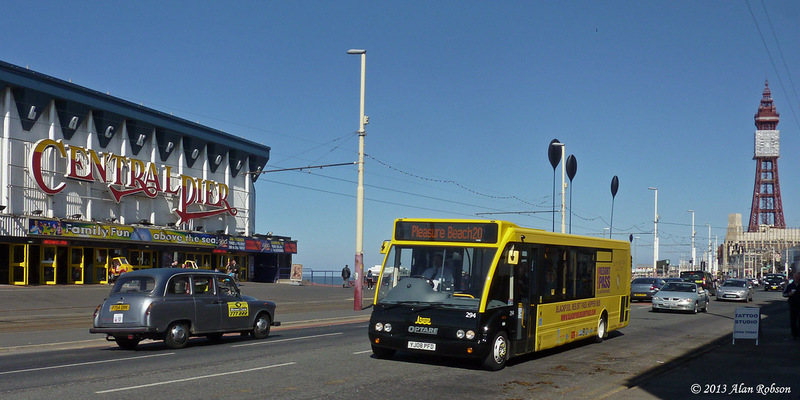 Today saw the first use of 325 on the Seafront 12 service, after a week spent promoting the newspaper. 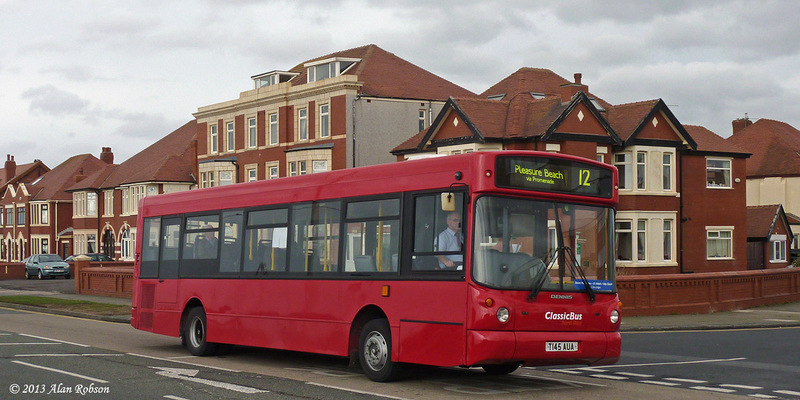 325 was previously in a green and cream colour scheme and is normally used on contract service work for Blackpool and The Fylde College. 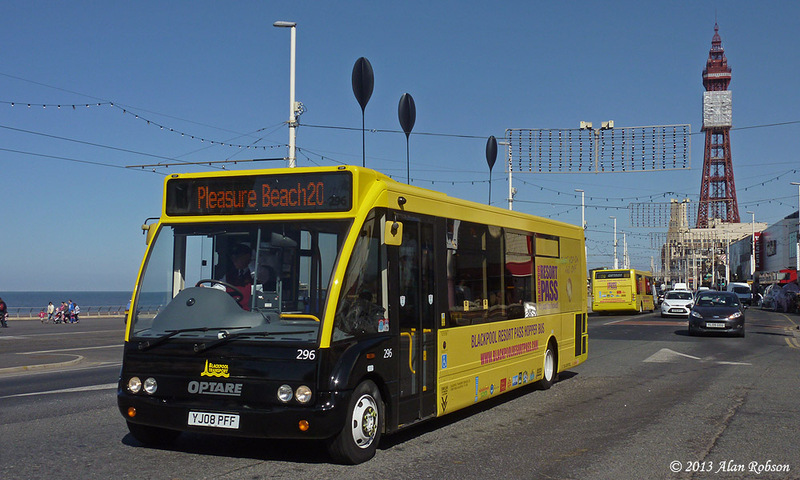 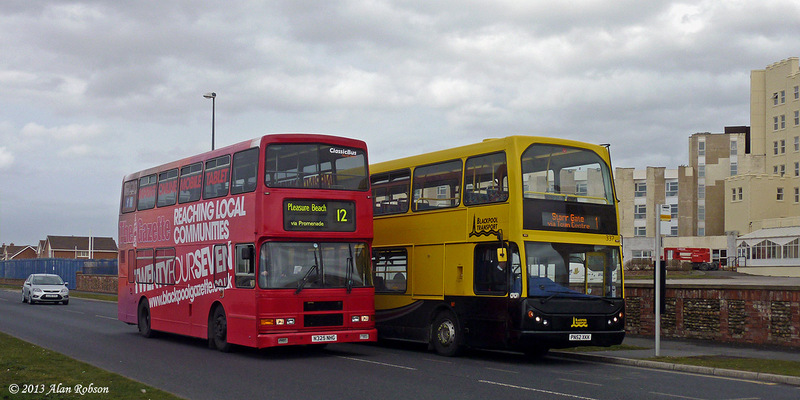 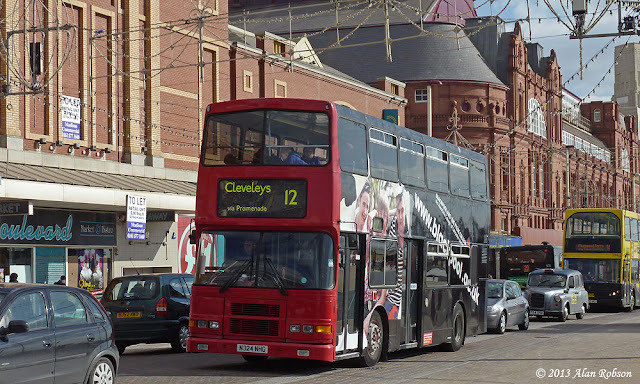 Blackpool Transport's route 20 began running again this year from 23rd March, using a mixture of double deck vehicle types. 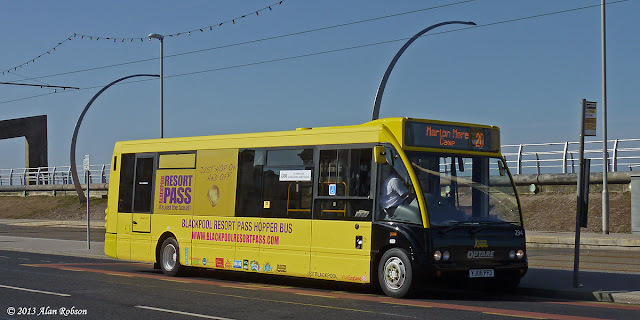 On Friday April 5th the route was relaunched as "The Resort Hopper", and began operating with a branded fleet of Optare Solos with yellow vinyl wrap advertising for the Blackpool Resort Pass. 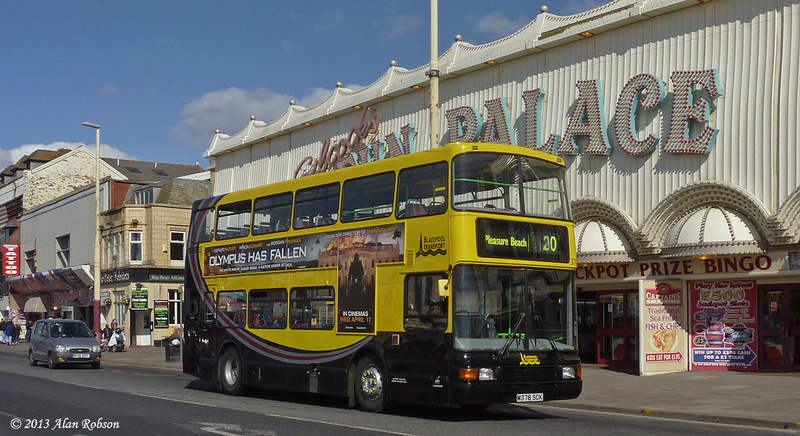 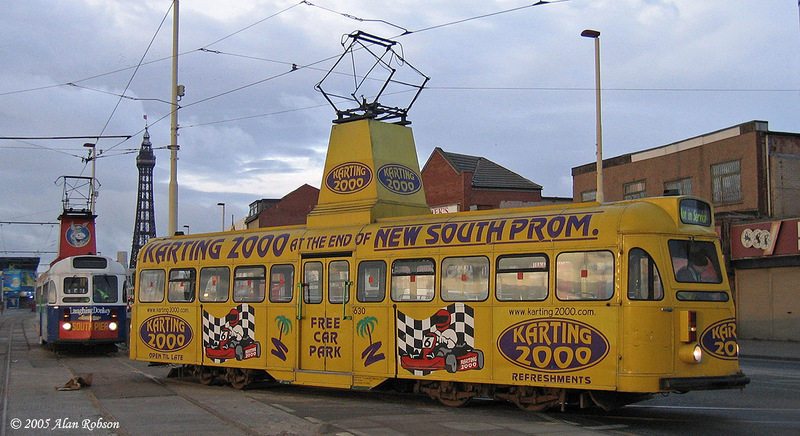 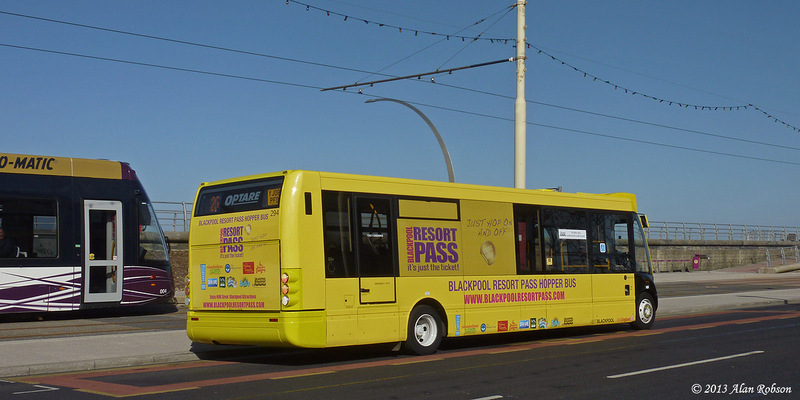 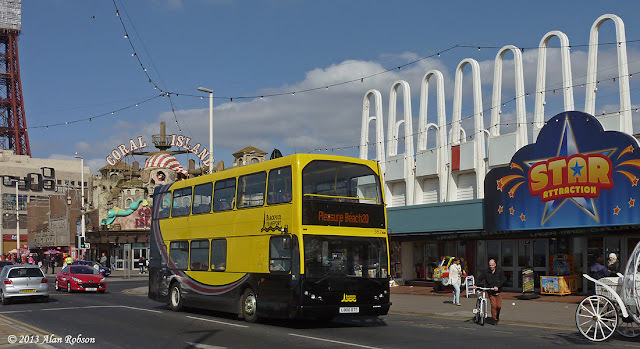 The service is being promoted as the route which links all of the attractions that take part in the Blackpool Resort Pass discount ticket scheme. 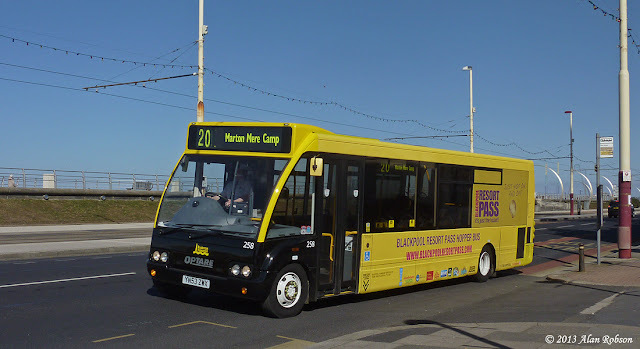 Until Thursday 4th April, several of the 1994 Northern Counties bodied Volvo Olympians had been used on the route, however from Friday 5th April the route began to be operated by the new yellow branded Solos, although the odd double-decker has been noticed in use as a duplicate during busy periods. 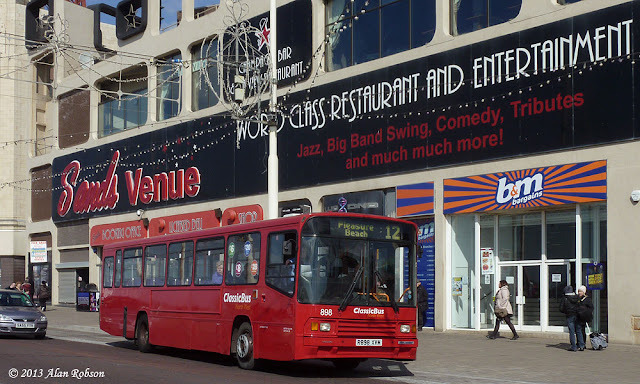 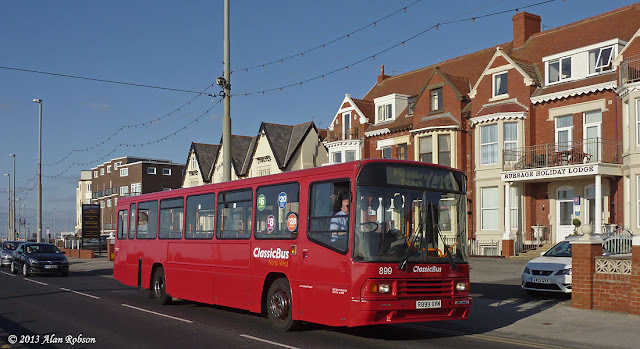 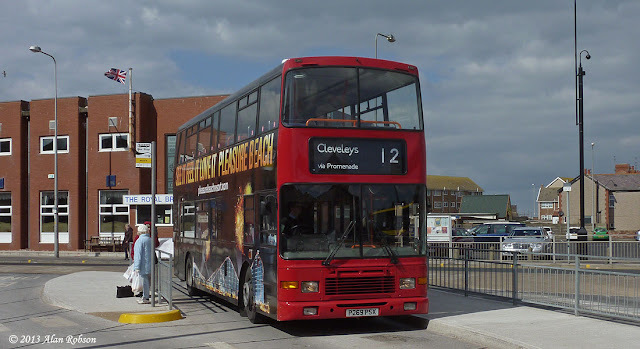 The start of the seasonal Classic Bus North West operated Seafront 12 service on 29th March along the promenade has seen the northern terminus of the route extended from the Cabin to Cleveleys bus station. 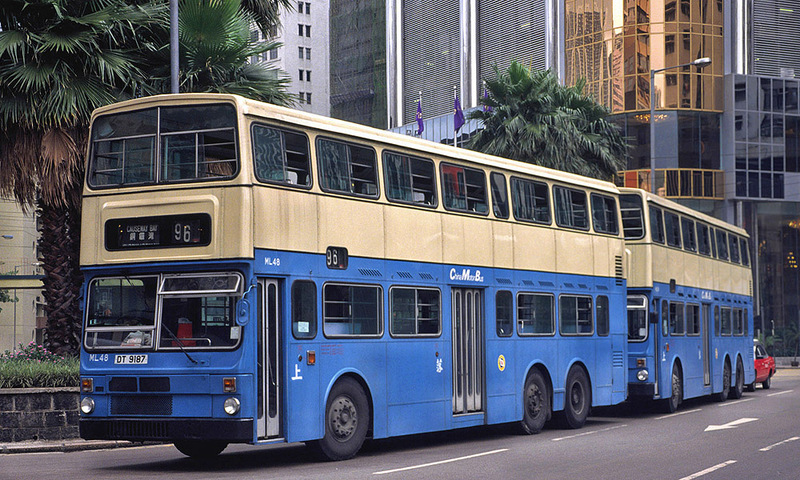 The service is currently being operated by Olympians and Volvo B10Ms and will hopefully be joined in the summer by some 102 seater 12 metre MCW Metrobuses, converted to open-top condition for use by the The Big Bus Company in London and originally owned by China Motor Bus in Hong Kong. On school days the Seafront 12 southern terminus will be at the Tower. 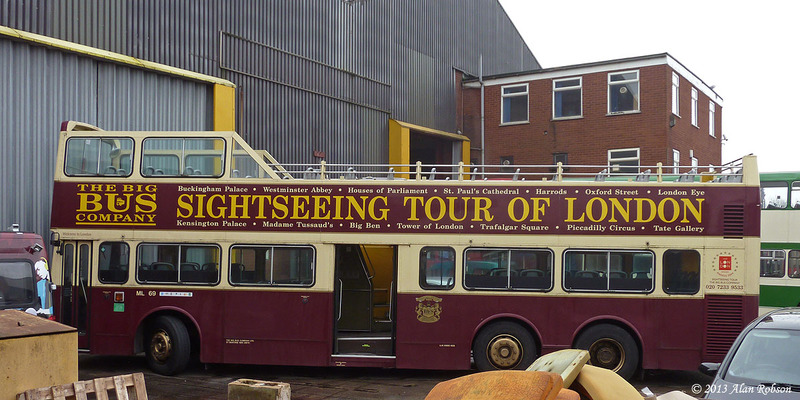 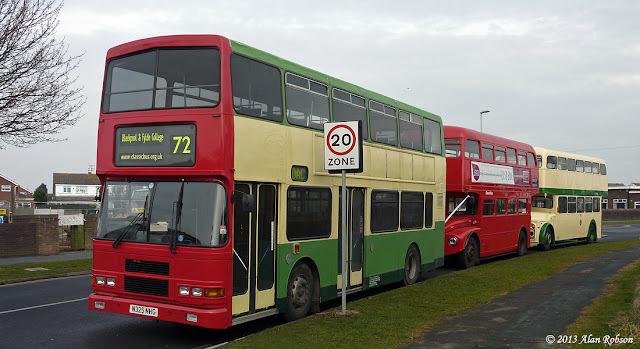 Easter Monday saw the first Heritage Tour of the day worked by twin-set 272+T2 on the timetabled run through to Fleetwood, the other heritage working being allocated to Standard 147. 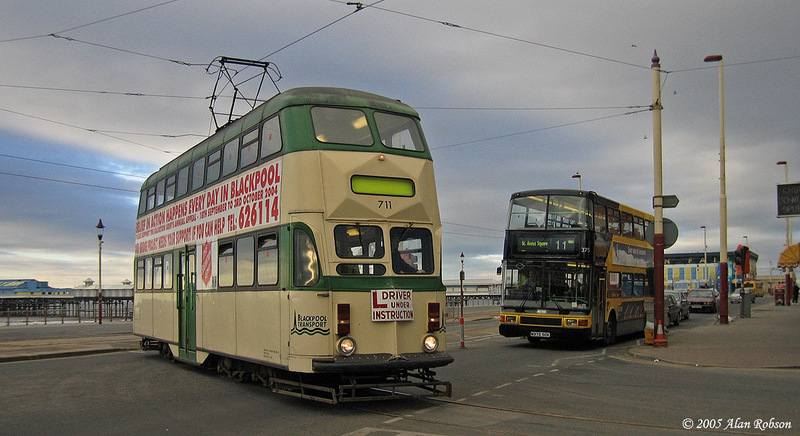 The morning specials were 706 Princess Alice and Balloon 717. 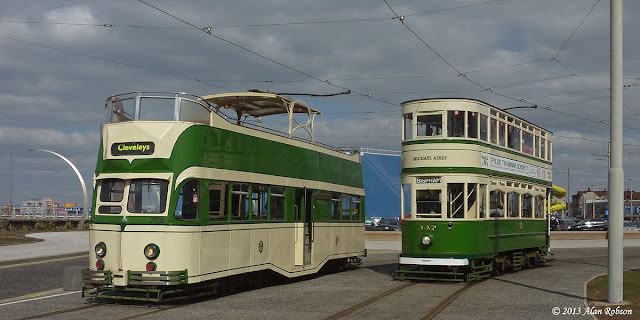 Princess Alice was swapped for Box car 40 in the afternoon, but an even more interesting swap was due to take place. 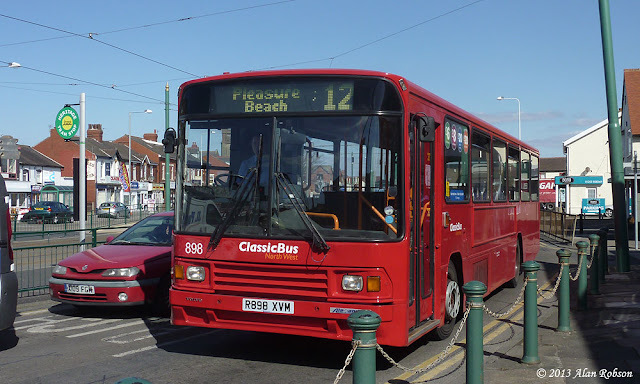 As the driver of 717 was close to retirement, he had requested the rare opportunity to be able to take a Boat car all the way to Fleetwood Ferry. 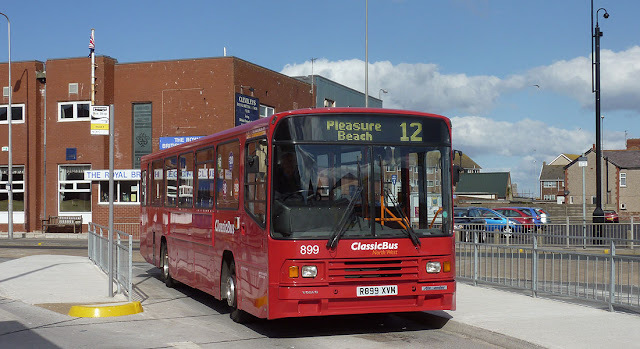 After taking 717 back to Rigby Road for his afternoon break, the driver duly arrived at North Pier with Boat 230 and big smile on his face when he saw the assembled crowd waiting to board. 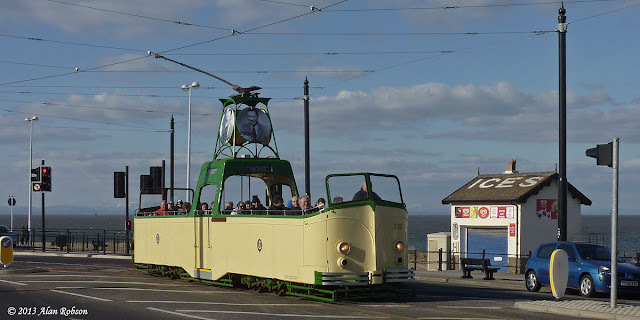 Fortunately the sun shone most of the way to Fleetwood, although it was still very chilly onboard, but the keen enthusiasts weren't likely to be put off the chance of riding a Boat in service to Fleetwood by a mere cold breeze. 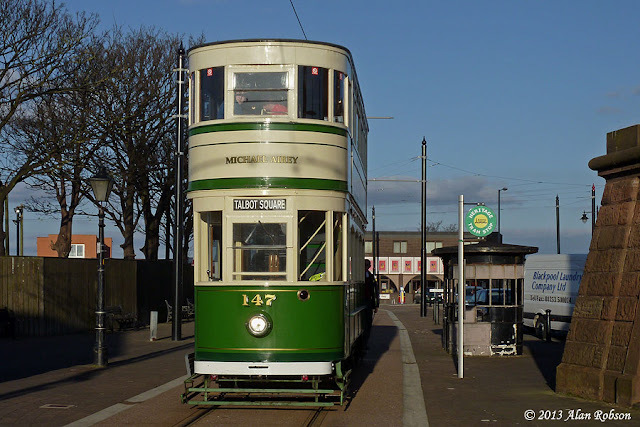 The day was finally wound up by Standard 147 running the last Heritage Tour to Fleetwood Ferry and back, and still the sun managed to keep on shining. 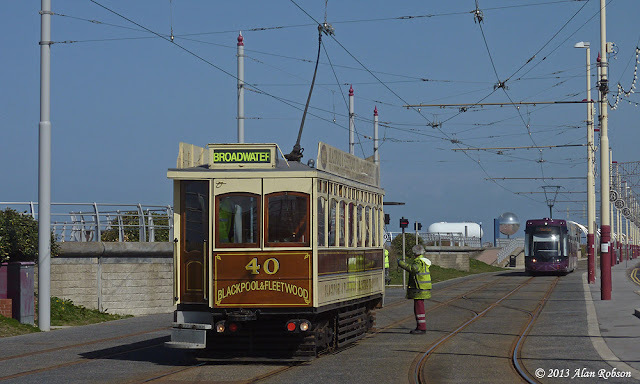 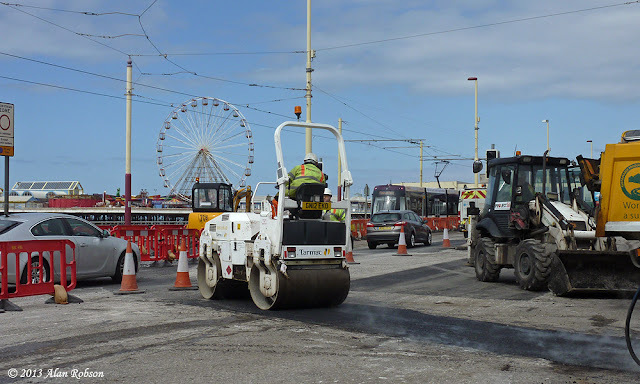 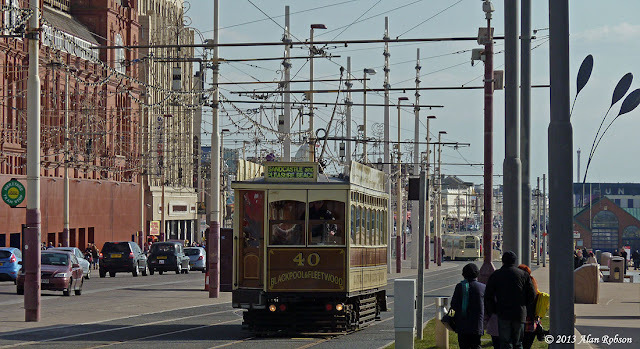 Thus ended a very successful four day event on Blackpool Tramway, and a huge round of thanks must go to Bryan Lindop and the heritage crews and maintenance staff for making all of this possible. Roll on May Day weekend.